In fact I rather believe that our Toby (above) is far more sensible than I shall ever be and even he has not lost his sense of humour. We did though celebrate the day to our very best ability and a few friends came around in the evening bringing gifts and giving us surprises. One of which was to perfume the room by washing the floor in a unique way, by using a full bottle of Prosecco ! Oh the sadness that followed, the wringing of hands and gnashing of teeth was almost too much to bear. When all had died down and equilibrium restored I quietly went to the fridge and replaced the fallen one with a golden bottle of the same - I do think that we have give people time to wallow. Mrs H said that we ought to see it as the birthing of a new birthday tradition - rather like the launching of a new ship by breaking a bottle of champers on the bow. I enjoyed all of the day, it was really good fun and intend to have many more. Though few will ever compare to my seventieth birthday celebration which went on for three long days, of twelve hour sessions with different friends arriving each day to do their best with laughter, music, singing and dancing. Might do something a similar next year... Mrs H please take note ! Well, onwards, onwards I must get back to the easel where a young mermaid is getting cold. Have fun all of you and have a great new year ! Hello Sue thank you for the greetings! Jack L said: Hello Mel. Very best wishes to you for a very Happy Birthday ! Nice pic of Toby as well....hmmmm guess he has taken up your pipe eh? Its great that you are active in so many different facets...I'd like to see your rendition of 'the Young Mermaid'..when you've completed it. 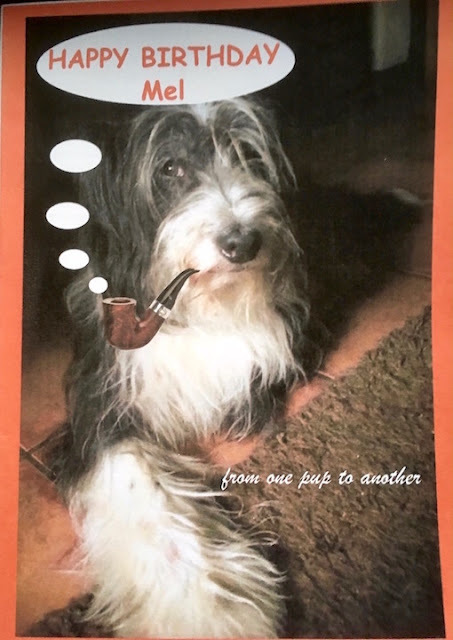 I don't mind Toby smoking a pipe, though I do object to providing him with baccy, ha'h might have to set up a crowd funding to support his habit - Laugh! What I object is his halitosis. Shall not be able to share pic of mermaid though as the model might object. Happy birthday Heron. I am exactly ten years your senior = but still enjoy life - so I hope it will be the same for you. Thank you for the good wishes Pat, er tell me when did you (as most women are) stop being coy about your age ? Happy Birthday for a week or so ago. Glad you had some friends to celebrate with. Happy days. I surely did have a great day in company with the best of warm kindly folk. Your comments are greatly appreciated Rachel. Any time is good time to have fun. Totally agree with you Dora - thanks for the comment. This is really interesting, I am a VERY rare visitor on Blogger nowadays, I know , I will repent some day. Anyway, among all sensible blogs my eye catch this personal postcard and I find you my dear Melvyn, in those spectacular red glasses you bought some time ago. Congratulations to the 76 bright years walking on this earth in the warmth of the sun, exploring the world with Toby and mrs H.
Not only am I thrilled to see this young 76 year old, I also learn the good tradition of washing floors with Prosecco. A bit expensive perhaps, but the tiles are shining, right? All the good blessings to you, Mel, and greetings to your lovely family. Many thanks for comments Solveig which are greatly appreciated. I am walking the earth though not always in sunshine. There have been storms some of them violent, some not, plus different types of rain from cold and icy to warm gentle sprinklings. Yes, sunshine of course and that to is varied. No matter what types of weather is delivered to us in life. For sure it is the recognisable spark within our inner being that is truly important and age has nothing to do with that, for being old does not bring wisdom... I think it is how we manage the storms that enables us. So sorry that I missed this due to a certain indisposition. May you have many more celebrations. Many thanks for your comment Graham and O how very muchI do wish for many more birthdays which is why I keep taking my pills. Great to receive a comment from you Hilary. About that particular drink, it reminds me a bit of champagne - which I do not particularly enjoy... yes, I know that both are quite strong and both remind me of fizzy cider wine that this aged man used to make long ago. My personal preference if it is still available would be a light and airy golden sauterne. Your comments are a welcome addition to the activity of this blog however,the use of swear words is not permitted.